Save big on your drawing education with our Best Value Collection for the beginning artist. The Foundation in Drawing Suite includes both the Beginning to Draw and Mastering Portrait Drawing 1: the frontal pose instant download workshops. Equal to a full semester of art school the Foundation in Drawing Suite is jam packed with rock solid instruction, skill building exercises and demonstrations designed especially for beginning artists. 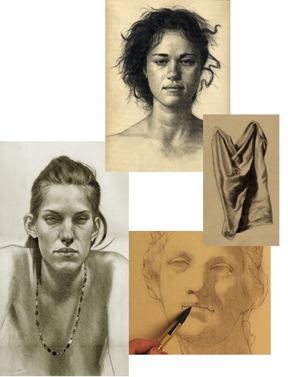 Learn how to draw anything as you are expertly guided through the basics of sighting and measuring, drawing technique, understanding tone, composing your pictorial surface, perspective primer, the history of drawing, and artistic terminology. Full demonstrations on the still life, drawing the portrait, dynamic drapery, and how to handle various drawing media such as classical sanguine and black conté, graphite pencil, and charcoal. Before I found you I had a natural ability to create some nice work in different mediums. However I never knew why or the rules or disciplines to make ones work a better piece. It always seem to turn out nice but after much frustration and correction. Proportions were often off and your lessons are a great help. I love that you started at the beginning as if we knew nothing. That is how it should be taught. Thats why you are "Master" Artist Michael Britton. A well deserved title. I have your portrait drawing DVD and it is wonderful. I watched it once and then I watched and did a drawing at the same time. I took notes on the techniques. The drawing came out fabulous for my first time. I can really see why it helps to know anatomy. I drew the muscles and bone with you and when I came back to the face it really helped to get the shape right. This DVD was better than any seminar I've been to and cheaper. Thanks again, I am so excited, as I am working to change careers. I feel inspired and hopeful. Beginning to Draw: The Foundation of Art  For the absolute beginner this four hour instant download workshop gets you up and drawing what you see accurately immediately! Regularly $54. 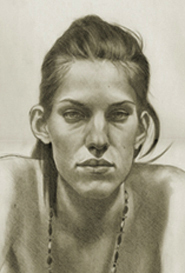 Mastering Portrait Drawing 1: The Frontal Pose  This four workshop trains you to draw realist portraits step-by-step. Regularly $54. GET THESE 9 BONUS DRAWING E-BOOKS! that regularly sell for over $110! The accompanying text and exercise Ebook for the Beginning to Draw Workshop. 74 pages. A complete 6 lesson course in itself that takes the beginning artist to the intermediate level. 59 pages. This Ebook presents 4 additional beginner drawing lessons to hone your rapidly developing drawing skills even further! 30 pages. 13 step-by-step beginner portrait drawing lessons beginning with how to begin a portrait drawing and concluding with developing tone (shading). Also included are the facial features - drawing the eyes, nose, mouth, & the ear. 108 pages. 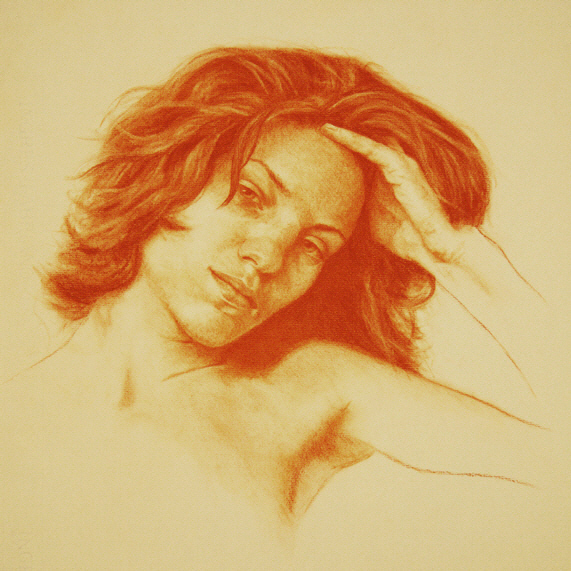 10 intermediate portrait drawing lessons: Drawing the Tilted Head; Rendering Hair; Drawing Children; Portrait with a Large Hat; The Construct; Incorporating a Hand; Elements of Facial Expression Part 1; Elements of Facial Expression Part 2; The Foreshortened Reclined Head; The Clavicles; and The Neck: Form & Structure. 75 pages. Recommended for the intermediate to advanced artist. This PDF e-book contains 9 lessons on drawing portraits with sanguine contè and the additive/subtractive process of building form. Also includes three lesson on the linear portrait using both black and sanguine contè. 73 pages. Seven intensive lessons on advanced portrait drawing techniques! This instant download lesson is SEVEN workshops in ONE! 133 pages. Your comprehensive reference for portrait drawing anatomy. The skeletal and musculature of both the frontal and 7/8’s profile view are presented indepth with detailed, full color images and descriptions that can be magnified for easy study. 84 pages. Drawing drapery requires a skill-set as distinct as portrait drawing is distinct from drawing the still-life. Although there are similarities in rendering plastic form in portraiture, still-life, etc., draped cloth requires an understanding of the various structures of the different types of folds. Comprises 7 lessons on each type of fold. 46 pages. These nine ebooks, sold separately, are worth over $110 of extra lessons and training! But order the Foundation in Drawing Suite instant download collection today and all this additional training is your's free! Would you be surprised if I told you I'd been searching half my life for this kind of instruction? I wanted to go to art school from a child, but I was so disappointed by a visit to the art college when I was 17 (... in Vancouver -- yes, it's my home town although I've been in England for 17 years now) that I changed direction completely and went to UBC to do languages instead. Since then, I've dabbled and futzed and eventually made my way via craft towards textile art, but always I've wanted to go back and learn the real skills of drawing and painting. As an adult, even if you can find someone to teach you (and that's not easy) outside a major city, you likely can't afford it. I've been receiving your newsletters for a couple of years now and always learn something, but I still felt I needed to start right at the beginning again, being so out of practice ... it is exactly what I'd hoped it would be: good solid explanation and demonstration of the skills and techniques, with progressive exercises to build them. I'm so pleased! Our best value for beginning artists! Get both the Beginning to Draw and Mastering Portrait Drawing 1: the frontal pose instant download workshops for ONLY $77! Plus over $110 of free drawing lessons!